We get a ton of requests for stone veneer siding application to the outside of the home, but another fantastic option that I don't think many people know about is using it indoors as a decorative accent. In this cool bonus suite over the garage we created an awesome stacked stone fireplace using veneer. The project was much quicker and less costly than using a more traditional stone product, and looks just as fantastic as the real thing. I really enjoy using it for interior applications because the thinner nature of the material makes it much easier to mount and accommodates smaller spaces better than a full stone. My favorite company for this product is definitely Eldorado stone because of the quality of their craftsmanship and the wide variety of color schemes and finishes that they offer. I have read a lot about new stone veneer products that are being offered for use on the exterior of your home, on fireplaces, and on accent walls but I had always been concerned that it would look too fake. Well, the other day I went over to my friend's house and was asking them about their beautiful back patio that is covered with what I thought was real stone siding. I couldn't believe my eyes when they told me that it was actually a faux stone product. 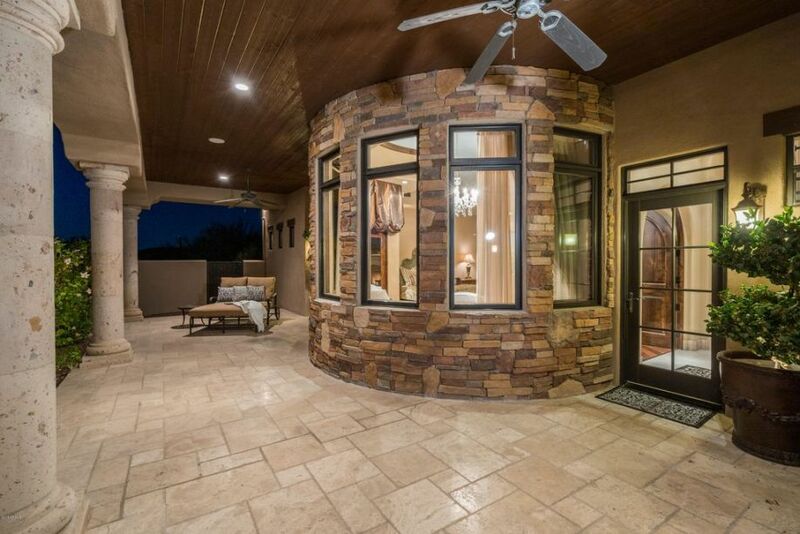 As you can see from these photos, the entire structure looks very high end from the patio floor, to the wood paneled ceiling, and curved stone bay window. Turns out that it is actually a cultured stone veneer product that cost about half the price of what the natural stuff would be. It continues to astound me just how versatile stone veneer is. I have worked in the construction world for several decades now (I'm not going to tell you the exact number and age myself haha), but interior decorators continue to dream up new and innovative ways to use stone veneer panels. This house was one of my favorite recent builds because we were able to create such a cool and luxurious look very quickly and easily using the pre-fabricated panels. 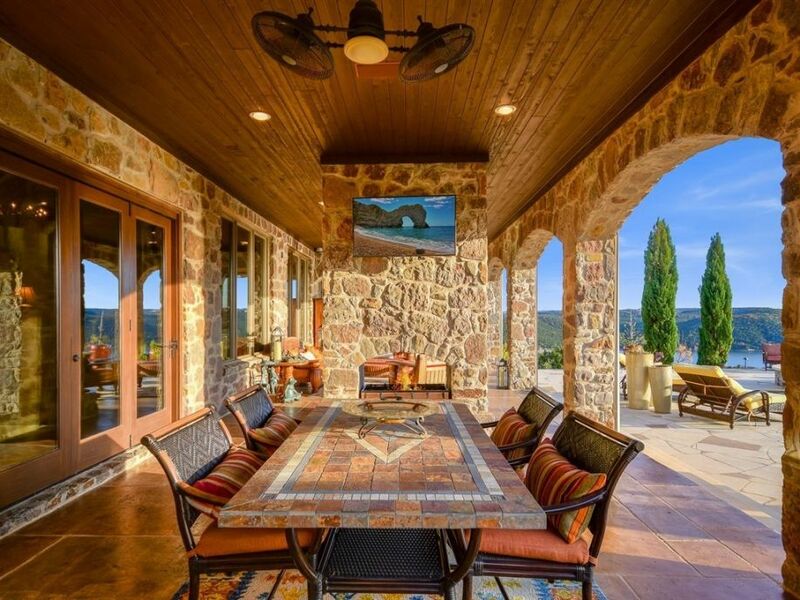 Quite frankly they make nearly any covered patio ideas with stone so so much easier to accomplish and, in my opinion, look identical to your typical natural stone pieces that take much longer and require much more skill to install. 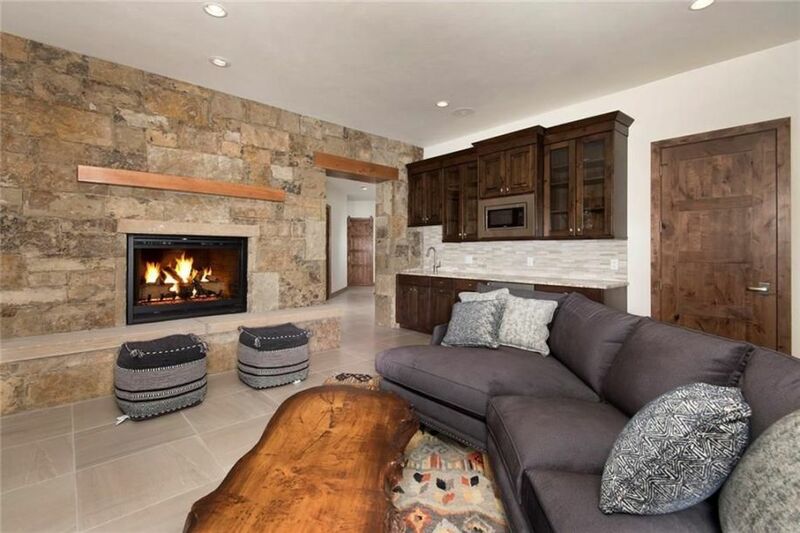 Stone veneer is such a versatile, affordable, and easy to use material that I am not surprised at all that it keeps popping up as one of the most trendy home decor trends for 2019. Most people only think of using stacked stone veneer as siding on their home, but it can actually be used in so many awesome decorative ways. Personally, my favorite way to utilize this awesome material is on outdoor fireplaces and hearths or on architectural detailing like columns and accent walls. This gorgeous outdoor fireplace with coordinating column that we just installed is a great example of how stunning stone veneer can look when applied correctly and accented with the right materials. Most people think that stone veneer can only be used as siding for the exterior of your home, but it actually has so many more unique applications that can beautify nearly any room you can think of. I love incorporating it into sunroom ideas to give those spaces a more rustic feel. 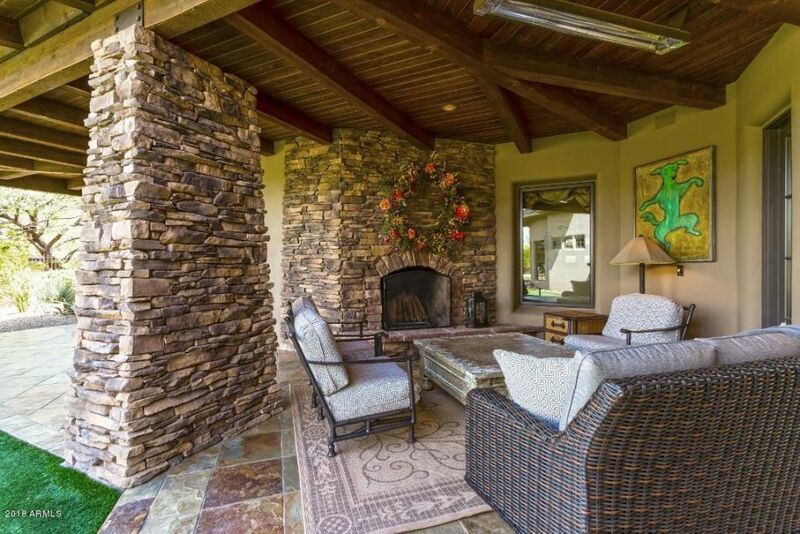 Or it also looks fantastic in an outdoor patio like this covering a large stone hearth. 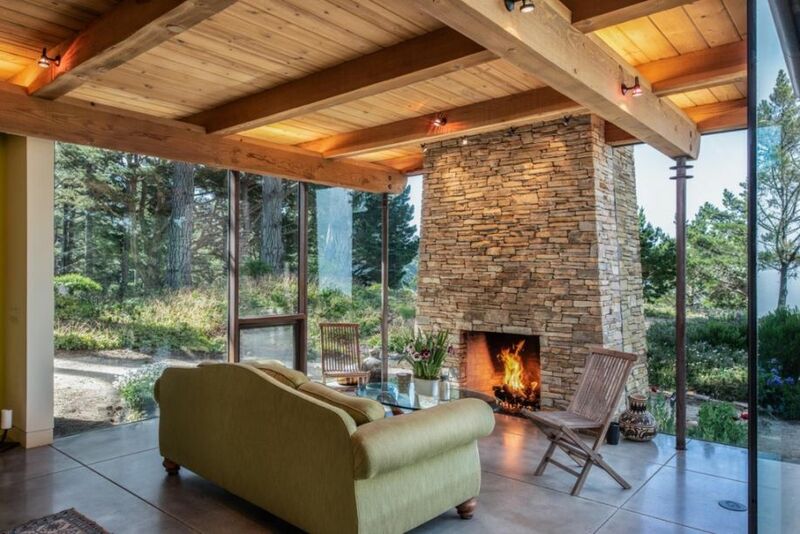 In fact, building a stone veneer fireplace is one of our most highly requested projects so far in 2019 and one that can make a huge design impact for a relatively low cost. If you have been considering adding one of these to your property, I definitely encourage you to look at our portfolio and dive right in. Stone veneer is a great option to use on the exterior of your home if you want the fantastic look of natural varieties at a fraction of the cost. We always tell clients to keep an open mind about stone veneer siding and do not automatically write it off as a "fake" product. There is nothing faux about it, the siding is actually thinly cut pieces of stone attached to your exterior as opposed to large chunks that take much more time and effort to apply. Exterior stone veneer can be made of the same quarry stone as your typical siding or it can be composed of man-made materials. Of course this will factor into your price point, but I personally think that both are absolutely beautiful.